Posted on Sun, Mar 4, 2012 : 12:07 p.m. 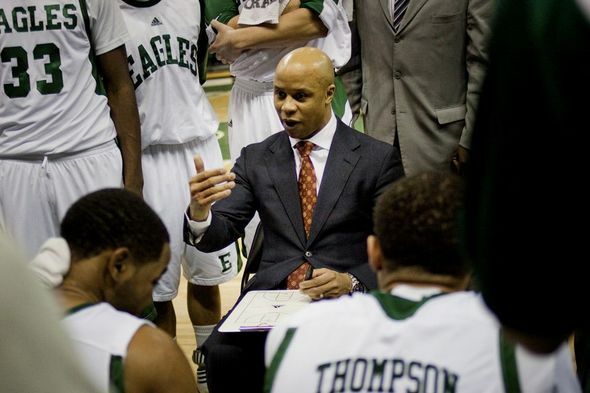 First-year coach Rob Murphy led Eastern Michigan to a MAC West title, a feat that would have earned the Eagles a top-two seed at the MAC Tournament in previous seasons. This year, EMU is the No. 5 seed and hosts Northern Illinois Monday night in a first-round game. Shortly after Rob Murphy was named the new basketball coach at Eastern Michigan, he was greeted with some gloomy projections. That’s not how the season played out for the Eagles, who were picked to finish last in the six-team Mid-American Conference West Division. Instead, Murphy led his team to its first division title. Under the format of the previous nine seasons, that would have meant the Eagles would advance straight to the MAC Tournament quarterfinals as one of the top two seeds. But in August 2011, four months after Murphy was introduced as EMU’s coach, those rules changed. This season, Murphy’s MAC West champions must play an on-campus, first-round game. Winner: Plays Ball State-Western Michigan winner in a quarterfinal Wednesday at Quicken Loans Arena in Cleveland. Tickets: $10 for lower bowl, $8 for upper bowl, available by calling 734-487-2282 or at EMUTix.com. A game against Northern Illinois at 7 p.m. Monday in the Convocation Center is essentially a play-in game to the MAC Tournament, played March 7-10 at Quicken Loans Arena in Cleveland. “I feel great about playing at home. It’s all about survival,” Murphy said after a win against Ball State last Saturday. “You have to play at home and win and, hopefully, get a chance to go to Cleveland and just see what happens." The new tournament format rewards the teams with the best league records, regardless of division. This season, those top four teams - Akron, Buffalo, Ohio and Kent State - are all members of the East Division. No. 1 seed Akron and No. 2 seed Buffalo advanced straight into the tournament semifinals. It’s a move meant to protect teams with a chance at an at-large bid to the NCAA Tournament from being eliminated early in the tournament. It’s also a move that leaves the No. 5-seeded Eagles (14-17, 9-7) needing to win four games in six days to pull off an unlikely tournament championship. A tournament title isn’t on Murphy’s first-year to-do list, but the team has already accomplished most of the items that were. He wanted to win more games against Division I opponents than the team did last season under coach Charles E. Ramsey. The Eagles doubled that number, from six to 12. Murphy also wanted to the Eagles to be tough to beat on their home court. They went 9-3 at the Convocation Center, with one of those losses coming against Michigan State. Mon, Mar 5, 2012 : 3:20 p.m.
Mon, Mar 5, 2012 : 1 p.m.
Sun, Mar 4, 2012 : 9:20 p.m.
We had a great time down at the Convocation Center this year, the boys played their hearts out and earned the title. Looking forward to Monday and the years to come! Sun, Mar 4, 2012 : 9:05 p.m. It's been a fun year, Coach Murphy! I hope you keep it going. Sun, Mar 4, 2012 : 7:20 p.m.
its as it should be. The new system makes more sense than the older system.